Home / Uncategorized / Wedgetail Pistol Case Update! We here at Firearm Owners United are pleased to share an important update on the Wedgetail WT15-01 case. Firstly, we would like to explain our lack of updates on the matter, this was simply due to waiting on the judicial process, progress is slow and there can be several months between scheduled appearances at QCAT. We will do our best to update everyone as things happen and we’re here to answer any questions. A lot has happened. We’ve had two cases in QCAT, and been involved in a related matter. QCAT has suggested legislation around suppressors be reviewed, there has even been a potential retaliation against a witness who provided an affidavit for our cases. On to the news! As you are probably aware, we have two cases currently before QCAT, a related matter we were involved in was dismissed. The related matter tried to establish a category by means of applying for the firearm as a Category D without a club letter – which was then rejected as no supporting letter was supplied (which is only required for Category H, an admission that the firearm is Category H?). The person involved applied for a supporting letter from their club, but were bluntly rejected. There are two matters before QCAT on behalf of FOU, one regarding a rejected PTA, and the other an application for a Review and Stay of Decision regarding the surrender of the Wedgetail WT15-01 firearms. The PTA matter has had its initial phase (conference), with a hearing due in April. The application for a Stay of Decision has been granted. What does this mean? In short, the named applicants get their firearms returned and may continue to use their firearms until the matter is decided. QCAT has determined that it has the jurisdiction to review the categorisation of a firearm, striking down QPS’s claims that they have no jurisdiction to do so. QPS claimed it was not their decision, but that of ballistics – this was rejected. QPS sought to have the stay denied on the grounds of “public safety” – but were unable to demonstrate what specific risk there was; that argument was therefore rejected as the member did not accept there was any concern to the public. Weapons licensing do not have the power to classify weapons, nor do ballistics. It is a matter of legislature. Further, it was WLB who referred the matter to ballistics to re-categorise the weapon. 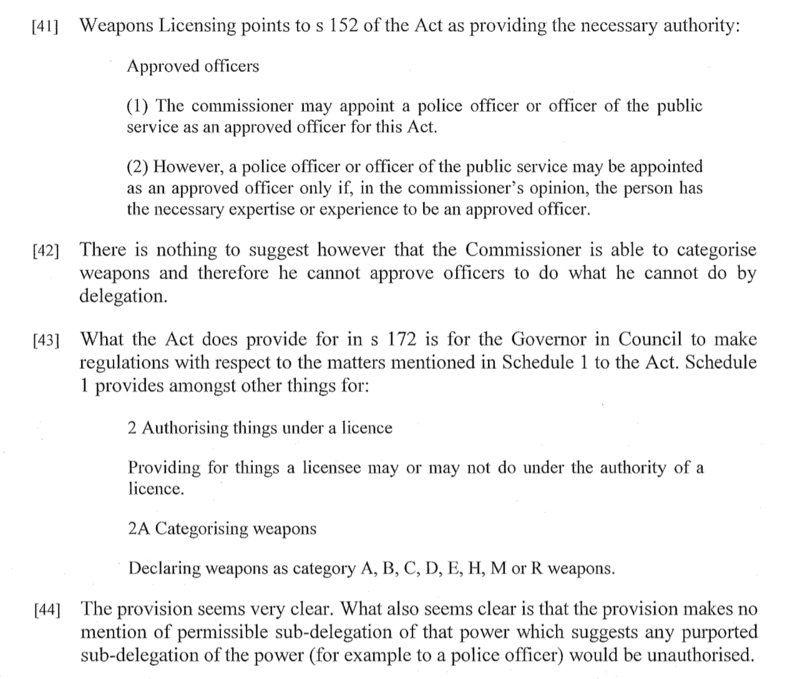 The QCAT member found that as the commissioner has no power to categorise weapons, they cannot authorise officers to do this on their behalf. And finally, the member notes that the final matter to be heard will be about the category the firearm actually belongs in, according to the Weapons Categories Regulations 1997. Setting aside the so called ‘decision’ by Ballistics, who had no such authority. That’s not all, a recent RTI release (thanks must go to LAFO Inc) contains a lot of interesting information regarding QPS’s attempts to ban gel blasters, desire to change the classification of lever release/lever action (repeating) shotguns, and the Wedgetail WT15-01 matter. Interestingly, the ballistics officer considered the firearm to be Category H, and calibre irrelevant in classifying a firearm under Category H. He put it in writing several times and appears to have held that view until WLB referred it to them asking if it was Category D (convenient). Even his colleagues agreed and no one in the Forensics Support Group (FSG) or Operational Support Group (OSG) – Scientific Ballistic Unit objected to the Category H classification. WLB then used calibre as part of their argument before QCAT. This casts serious doubt over the motivations of involved officers, and their impartiality, as they had been specifically told by the Ballistics officer that calibre did not really come into categorisation. This has some important legal ramification for shooters withing Qld, firstly it confirms what is obvious from the legislation. That neither Weapons Licensing Branch nor Ballistics have any special legal powers to classify weapons. 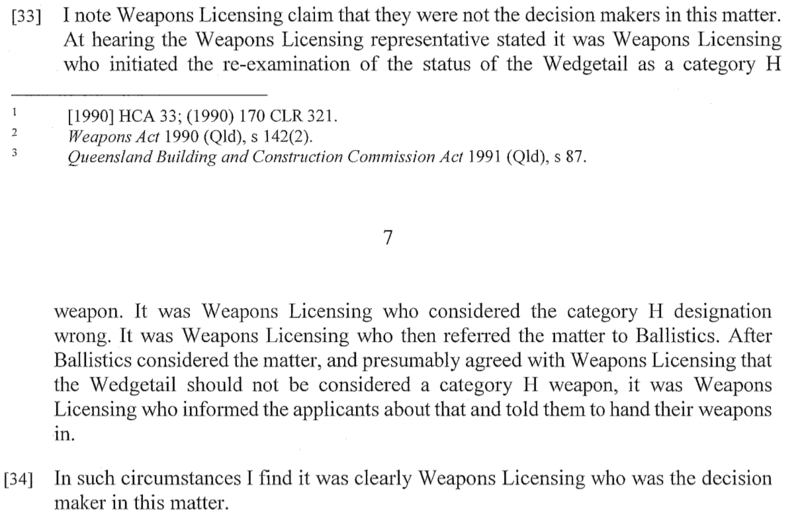 Secondly that when the authority for a firearm owner to hold a weapon is revoked, that person has a right of appeal to the Tribunal, something the Weapons Licensing Branch tried to deny. There is a long road ahead full of hard work, hearings, and probably appeals. But FOU has made significant inroads and the findings of QCAT members thus-far have given insight into the correct interpretation of firearms laws in Queensland. Awesome stuff! Well done guys for fighting the good fight and everyone who contributed. Long way to go yet but what a great start! Good! These anti firearm bureaucrats that think they can make up the rules as they go need squarely putting back in their box and I’m glad you assisted in doing that. Thank you! Hopefully it might help towards sensible firearms legislation in this country.